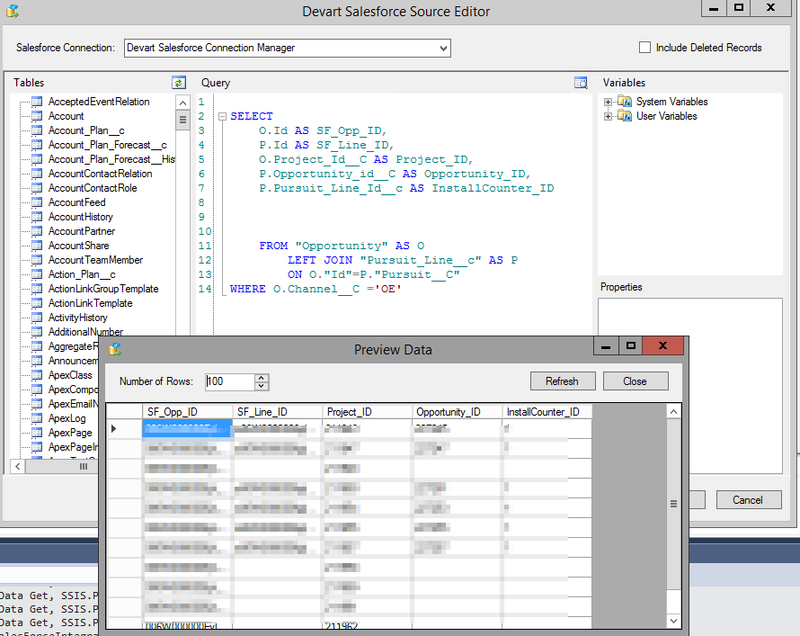 OLE DB provider "MSDASQL" for linked server "dsf" returned message "[Devart][ODBC][Salesforce]Unknown column 'Col1050'". Cannot execute the query "SELECT "Tbl1003". "Id" "Col1050","Tbl1003". "Name" "Col1051" FROM "Account" "Tbl1003" ORDER BY "Col1050" ASC" against OLE DB provider "MSDASQL" for linked server "dsf". Didn't understand relationship 'Pursuit__r' in field path. If you are attempting to use a custom relationship, be sure to append the '__r' after the custom relationship name. Please reference your WSDL or the describe call for the appropriate names. if I copy the code above and use it in ODBC it works WITHOUT the WHERE clause. If i keep the where clause (Channel__c) then I receive the same error as the ODBC error on top. 1. 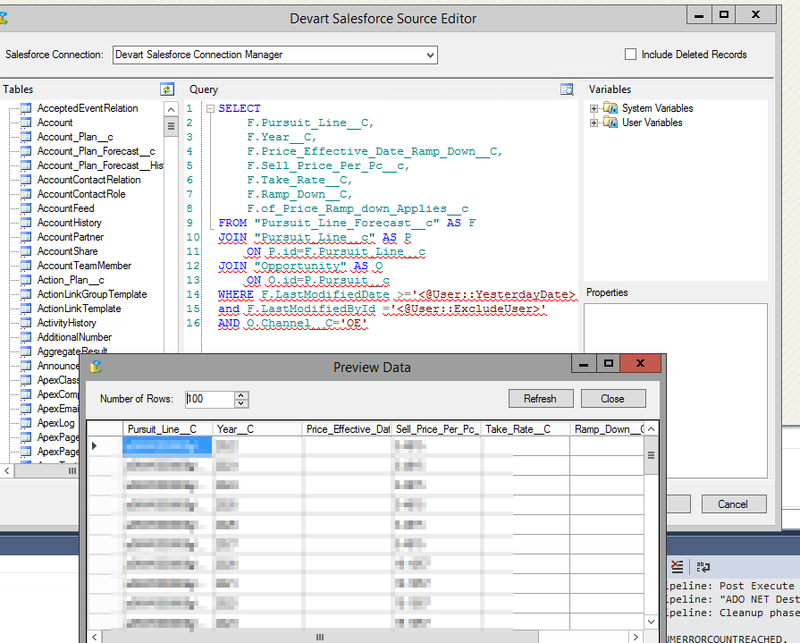 "Devart SSIS Data Flow Components for Salesforce" and "ODBC Driver for Salesforce" are two separate products. Could you please report the issue with "ODBC Driver for Salesforce" at viewforum.php?f=55 ? Also specify the link to this thread in the new report. Thank you. It works in both cases "Preview Data" and runtime within VS2015. a) what does running "SSIS TASK" mean? How are you running your SSIS package to reproduce the error (in VS2015 OR in SQL Server Agent from SQL Server Management Studio OR in dtexec.exe, etc)? c) does the issue persist with other custom objects?